Azure, issuant from a border wavy two inverted piles, each surmounted by a trefoil below a star all Argent; on a chief Or, an anchor cable of the first. 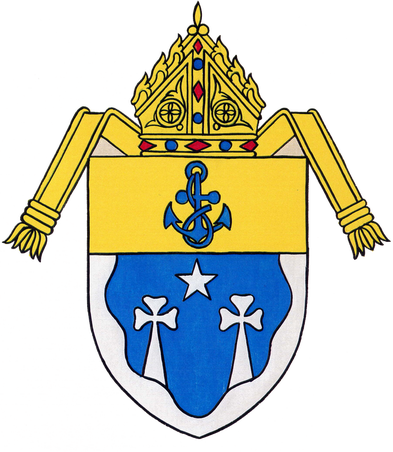 The arms of the Diocese of El Paso are composed of two main sections. The first and major portion of the design is blue and silver (white) to honor the Blessed Virgin Mary, in her title of the Immaculate Conception, Patroness of the United States. The blue filed is enclosed first mission established at what is now El Paso was called "Ysleta," which is Spanish for "little island." The wavy border is also used to represent the river, Rio Grande, at which El Paso is a border city with Ciudad Juarez, Chihuahua, Mexico. Issuant from the base of the design are two silver (white) inverted piles (triangles with their points upward) to signify the two hills that form "the pass," "el paso," for which the city is named. This play on the name is completed by the Texas Lone Star, the North Star, because the See City was formerly known as "El Paso del Norte." Each of the piles is ornamented by a trefoil (a three petal flower or shamrock) to honor the titular of the Cathedral in El Paso, St. Patrick. The upper third of the design know as a "chief," is gold (yellow) and is charged with an anchor equipped with a rope, called "cabled." This representation is taken from the arms of His Holiness, Pope St. Pius X, who established the Diocese of El Paso in 1914.